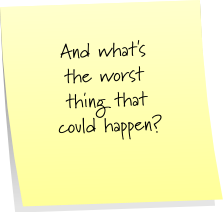 I sit at my laptop writing this with a yellow post-it-note stuck to the keyboard under my left hand that reads: “And what’s the worst thing that could happen?” I stuck it there yesterday after I had a discussion with my oldest one about his fear that his little brother would reach up on his shelf and get his Legos. I was surprised, but he worked through it and left calm about the situation. God will be with you. He will strengthen you and help you; He will uphold you with His righteous right hand! Loved this. I have done many Beth Moore studies but not the Esther one. Worry is something that occupies my mind too much, and I appreciate this reassurance. That is a wonderful reminder. That’s why we don’t need to fear! I’m going to share this idea with my little daughter, who tends to fret about a lot of things. Thanks. I love this post. Worry is my middle name at times so this is a great reminder. I think I’ll have to go and grab a post-it note real quick and jot this down. Hope you have a great day, Michelle! Aw, sweet Jellybean (with a jellybean inside)… you know me so well! ;) I’ll be praying for you today… in fact I’ll pray right now! Love ya! Such a good post and Scripture to go with it! My brother taught me that a few years ago, the ‘What’s the worst that could happen?’ and it has stuck with me. Knowing God and knowing that He is always with us AND remembering to think ‘What’s the worst that could happen?’ really calms the soul. God is still always in control of the Universe, and that includes everything that happens in our lives. How could we not trust the Lord of the Universe? Girl, your comment is powerful!! God is ALWAYS in control!! And don’t you just love that scripture?! Imagining the worst… EVERYTHING is crumbling and falling to pieces all around (kind of like the movie 2012), but there’s a river that is calm and peaceful… may we be that river! God is within her, she will not fall; God will help her at break of day. I’ve said it before, but I’ve just got to say it again: Girl, when you get to thinking, it’s impressive! For me, this is a huge, huge thing. I am a worrier. I’m pretty sure it’s a genetic thing. I have it. My oldest has it. My husband doesn’t, and niether does our youngest. Hubs is always telling me “What good is worrying about it going to do?” And he’s right. The worrying does nothing but make you feel helpless and afraid. But it’s still something I am constantly struggling against. When I refuse to let the worry in, and rely on God instead, I’m always amazed by the results. They almost always exceed my hopes for a “best case” scenario. It’s awe-inspiring what happens when we truly trust Him. You’re just preachin’ it today, girlfriend. He will uphold! Amen. Yes, He will! Btw, loved your typical Mommy day post! May we see as He sees! Love that Psalm!! and I love that reminder! What a great way of looking at worry! Isn’t God’s word GREAT?! I love that Psalm, too! Thanks for the reminder Girl! Loved that study and loved that you were there with me. It’s so true that He is with us always and gives us peace when we ask for it. The thought of my mom dying always haunted me and I felt that I would just die too if it ever happened, but I’m still here a year after her death and His peace keeps me going! Thanks for the provoking thoughts my friend!!! Love you!!! Loved the post! Stopping by from iFellowship! I stopped in from iFellowship a few days ago, and your words were such a great reminder to me. Over the past few days, God has brought them to my mind on more than one occasion. Thank you so much for sharing what God is teaching you. It was a blessing to me! Previous post: You’re ALL Invited… Hope You Can Come!